Release Date: July 27th, 2007 (Cinema Village) by First Run Features. BASIC PREMISE: A documentary about a group of 28 individuals who protested the Vietnam War by destroying files in the draft board office building in Camden, NJ. 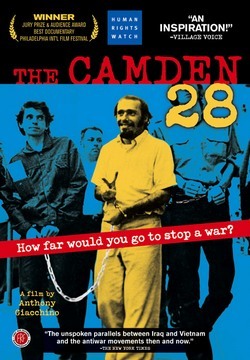 ENTERTAINMENT VALUE: The Camden 28 feels consistently fascinating and provocative without being preachy or redundant. Back in 1973, 28 men and women known as the Camden 28, decided to take non-violent action to protest their opposition to the Vietnam War. Most of them were Catholics and 4 of them were actually Roman Catholic priests. One of the members of the Camden 28 admits that it became harder to recruit more members who would put themselves on the line to break the law knowing that the FBI has already arrested other members. The story isn’t nearly over after their arrest because now they have a chance to defend themselves even though it’s as if it were David vs. Goliath. Director Anthony Giacchino wisely allows the story of their raid and defense to be told from their own present-day words and focuses on their accounts rather than through narration. This helps to humanize them so that you care enough about them so that you can root for them throughout the film. By the time the trial starts, two suspenseful mysteries remain, one of which is whether or not the Camden 28 will be found guilty or not guilty and another regarding which member of the group ratted on them to the FBI. With a fast, slick pace, plenty of well-chosen archival photos and footage, and at a running time of 83 minutes, The Camden 28 never overstays its welcome and not a single moment drags. SPIRITUAL VALUE: It takes a lot of courage to stand up for your beliefs even when it involves a lot of risk. There are different ways to prove a point and the Camden 28 chose one that merely included raiding an office building. They claim that the war in Vietnam is a much more serious crime compared to the raiding. Throughout their imprisonment and the trial, they made their anti-war sentiments loud and clear to the rest of the country and, above all, managed to make an impact that still resonates to this very day. IN A NUTSHELL: Fascinating. A timely, provocative and resonating documentary.